If you’ve followed my reviews over the years you may recall I have absolutely no issues with old dudes mowing down faceless bad guys and creating an excessive amount of collateral damage. It’s become the norm to poke fun or roll your eyes at these leathery sextagenarian (at this point, even septuagenarian) actors who remain in the genre they’re known best for. 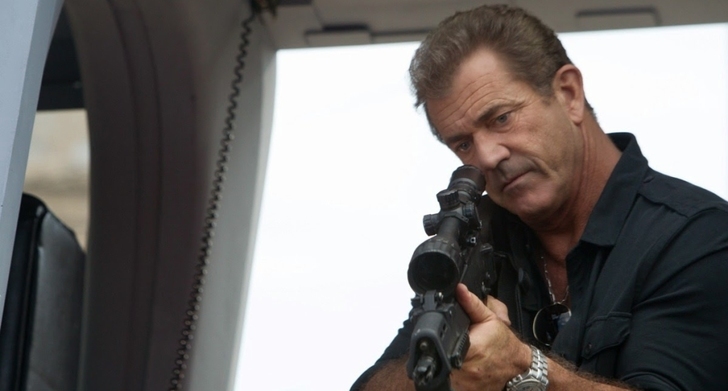 I’ll take the action veterans of “The Expendables” movies over any new blood that other action movies try to sell us as the next best thing. 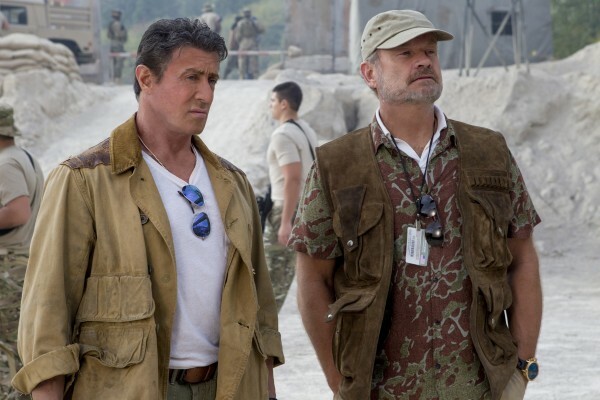 I appreciate what Sylvester Stallone and company were doing with the first two movies, but “The Expendables 3”, with its tedious recruiting montage, a terrible injection of youth and a sad attempt at addressing aging, wore me down and ultimately bored me. This second sequel opens with a rescue operation, just like the last sequel. 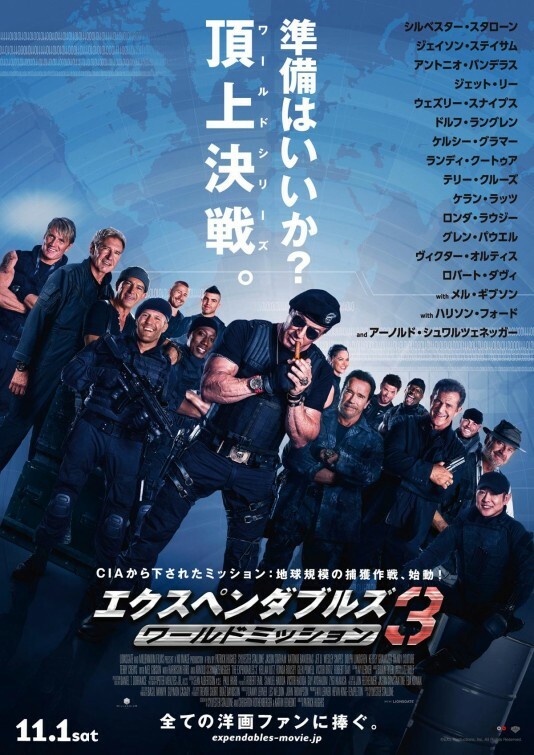 This time Barney Ross (Sylvester Stallone) and his gang of mercenaries for hire, including Lee Christmas (Jason Statham), Toll Road (Randy Couture) and Gunner Jensen (Dolph Lundgren), are extracting imprisoned original Expendable, Doctor Death (a sorely missed Wesley Snipes), from an armored train that’s delivering him to a Russian military prison. It’s an exciting opening action sequence (though not as fun as the last one) that reminds us of Snipes smooth moves and sense of humor. It also has the first of a handful of meta moments, where we see Doc answer “tax evasion” when asked what he was in for. You can see the movie’s potential right there. Unfortunately, it can’t maintain or rely on the witty quips throughout the rest of the movie. The team meets up with Hail Caesar (the always energetic Terry Crews) in Mogadishu in order to intercept an arms deal. Barney is shocked when the dealer turns out to be Expendables co-founder Conrad Stonebanks (Mel Gibson), who he thought was dead. When Stonebanks almost wipes out the team and seriously injures one of his own, Barney decides to take him down. 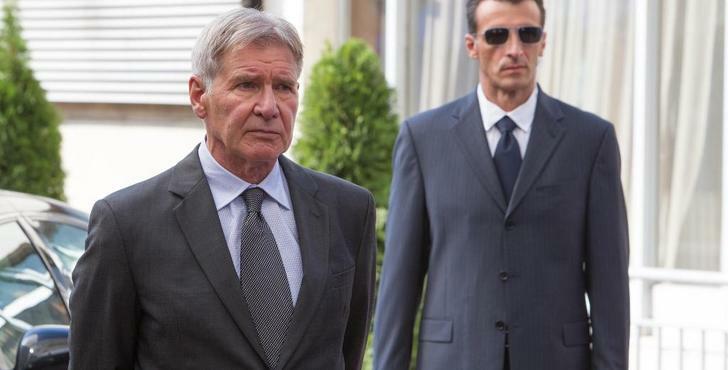 Coincidentally, this happens to be the new assignment from new CIA operative, Max Drummer (Harrison Ford), who provides Barney with Stonebacks’ new location in Romania. Another meta moment occurs when Barney asks Drummer what happened to Church (played by Bruce Willis in the last two movies, but backed out of this one over a money disagreement) and Ford delivers the line, “He’s out of the picture”. Funny, but I felt like he might as well had turned his head to the audience to say it. Barney is visited by his sometime rival Trench Mauser (Arnold Schwarzenegger) who informs the weary leader that he’s available if he needs him – which informs us that we’ll be seeing more of Ah-nuld soon enough. As if that was hard to figure out. Wait till you see his awkward scenes during the film’s conclusion. But Barney is sobered by the hit to his team and tells his friends-in-arms that they’re done. 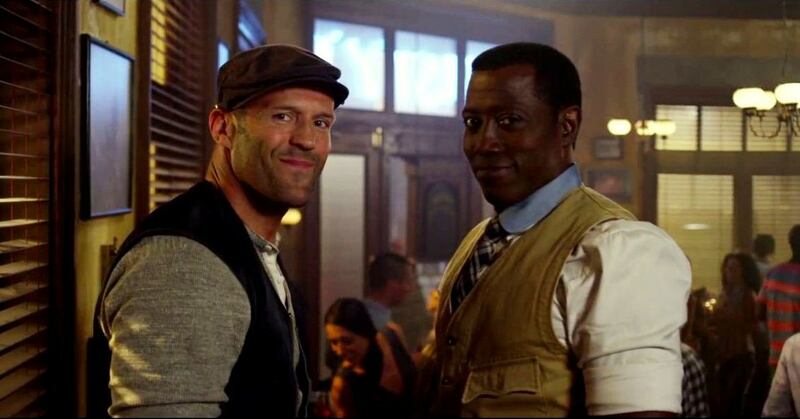 It took him three movies to realize “we’re no longer the future” and as Barney walks away from his team, we’re now subjected to a sad sack montage of Statham and Snipes moping in their respective homes. Ugh. Here’s where the movie turns into a labor of lull. We watch as Barney goes to Vegas to meet up with underground recruitment expert, Bonaparte (Kelsey Grammer, fresh off of “Transformers: Age of Extinction”), a former merc and current ally, who takes Barney on a cross-country tour to find some fresh young warriors. The result is a quartet of some of the most uninteresting and flat characters I’ve seen in a while, played by individuals that can hardly be called actors. There’s tech geek Thorn (Glen Powell), who has a penchant for climbing, nightclub bouncer Luna (played by UFC fighter, Ronda Rousey), weapons expert Mars (Victor Ortiz, a professional boxer) and cocky former Marine named Smilee (played by duh-face stud, Kellan Lutz, who put us to sleep earlier this year in “The Legend of Hercules”). Even if these ‘actors’ were given some decent material to work with, it’s evident by what we see here that it just wouldn’t work. This all takes place during the aforementioned tedious recruiting montage. I get it. I know it’s needed and, surprisingly Stallone and Grammer have pretty good back and forth, but I just found myself drifting off during their tour. It’s bad enough this is the longest movie of the three, but giving us sequences that serve as an endurance test doesn’t really help us forget about the time. It’s during this sequence that we’re introduced to motor-mouthed fighter Galgo (Antonio Banderas), who’s desperate to team up with the Expendables, but comes off like a cross-between Speedy Gonzalez and the Tasmanian Devil (albeit in the most annoying way possible). When Banderas entered the scene, I closed my eyes hoping he would go away and all I visualized was Puss in Boots on acid. Bandera’s needy Galgo supposedly serves as comic relief, but I found him offensive, ridiculous and useless. I already know I’m in the minority, since I heard from others who liked this character, but he came across to me as a joke that only the joker thinks is funny. Eventually, the newbies and the old dogs team-up to battle Stonebanks and his countless (and mindless) military goons amid the remnants of a fictional country called Azmenistan. Wouldn’t want to offend an actual country, right? They are joined by back-up help, Trench and Ying Yang (Jet Li, in an embarrassingly odd cameo), who have hot-dog helicopter assistance from Drummer. 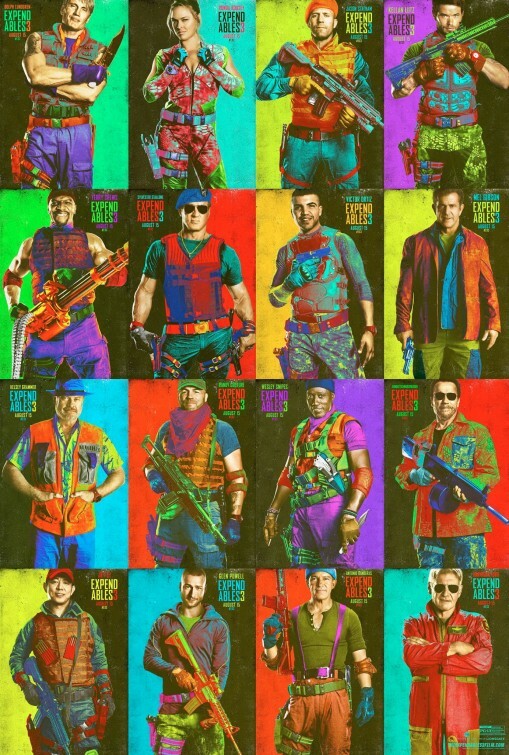 The mashed-up Expendables will have to work together in order to take down Stonebanks and prevent him from selling nukes to the highest bidder. It’s just a good thing this climactic battle takes place in a hotel ruin, far away from any civilian activity. The draw of the original conceit of the Expendables was seeing a bunch of former 80s action stars getting back into the game. I was up for that and quite enjoyed what was offered, considering they didn’t try and be something they weren’t. But now we have a PG-13 action flick that tries to go beyond the formula that worked in the last two R-rated movies by breaking up by taking out the old, replacing them with dull youth and then trying to get all serious about age. That just doesn’t work. None of that is wanted or executed well, nor do we want any of it. To reiterate, all we want going in is nonstop action with these movies. That’s it. What co-writers Stallone, Creighton Rothenberger and Catrin Benedikt fail to understand is that the audience only sees the larger-than-life stars in this ensemble cast. They look at Stallone and see Stallone, not Barney Ross. Same with Statham, Schwarzenegger and pretty much anyone else. It’s all about seeing them on-screen wasting bad guys and blowing stuff up real good. This is basically Rambo, the Terminator, the Transporter, Han Solo and Mad Max all mixing it up on the big-screen. That’s why they’re cast in a movie like this – to see everyone together. It can be a cool gimmick, but trying to do anything with the script beyond that gimmick is kind of pointless. The characters that these actors are known for are iconic and hard to get out of our heads while watching these movies. In the last movie, Stallone tried to bring in younger characters and include a female – but anyone remember Liam Hemsworth or Yu Nan? Didn’t think so. It’s understandable for them to want to think about the future by casting younger actors and also understandable to aim for diversity. But they forgot that the reason tickets are sold for these movies is to see old dudes causing chaos. None of these young actors carried any kind of lasting presence and I would be completely content if I never saw them in movies again. As the villain, Gibson is just fine. That is all. I couldn’t help but think of his villain role in last year’s “Machete Kills”, which allowed the actor to sink his teeth into some comedic material. It was a stereotypical role, but there was a good degree of crazy present that helped seal the deal. Not so much here. Although, Gibson is game to bring the crazy, the script he’s given doesn’t provide it. Stonebanks should’ve been colder, crazier and more of a psychopath. Instead, we’re subjected to Gibson reading off a tiresome line like, “You shoulda killed me when you had the chance!”. Oh, please no. There is somewhat of a villain monologue moment where Stonebanks explains how his murderous ways are really no better than the body count that the Expendables has accrued. He honestly makes sense and has a point. What makes Barney and his team the good guys? Because we’re told they’re the good guys. In the past two movies, we actually see the Expendables go out of their way to save the helpless or those caught in the crossfire, but this movie has no room for that. It also doesn’t have any more room to delve deeper into the fundamental differences between Stonebanks and his former teammates. That could’ve been interesting though. And then there’s Harrison Ford. His was the most bizarre casting out of all the new additions. His action movies were never about overt machismo or broheim. He was the reluctant hero. It seemed like he just wouldn’t fit in this crowd. Honestly, I didn’t know what to make of his first appearances in this movie. He still came across like a bit of a curmudgeon, but at the end it was obvious he was chosen for his real-life piloting skills. It’s probably the only reason he agreed to the small role. Australian director Patrick Hughes, who will be remaking “The Raid: Redemption” for American audiences, was chosen after his Down Under thriller “Red Hill” from 2010. It’s a good one, much better than what he shows us here. These movies need an action director who offers unforgettable action scenes, not semi-indecipherable ones. Watching this movie made me appreciate Simon West’s direction in “The Expendables 2”. Throughout much of the action here, it just felt like a video game clip in between levels. Plus, there’s so many characters here that it’s kind of hard to keep track (let alone care about) of all the dispensing of the bad guys that we see. If there’s even a chance for a fourth movie, I hope they go darker and back to an R-rating. A movie like this needs that punch in the gut feeling we get when watching real violence unfold. I suppose anyone who enjoyed the previous two films won’t have a problem with this entry. I was the opposite. I see potential in the simple premise of the franchise and the deviations here are distracting and unnecessary. As it stands, I can’t see them going any farther, but you know how these things go.